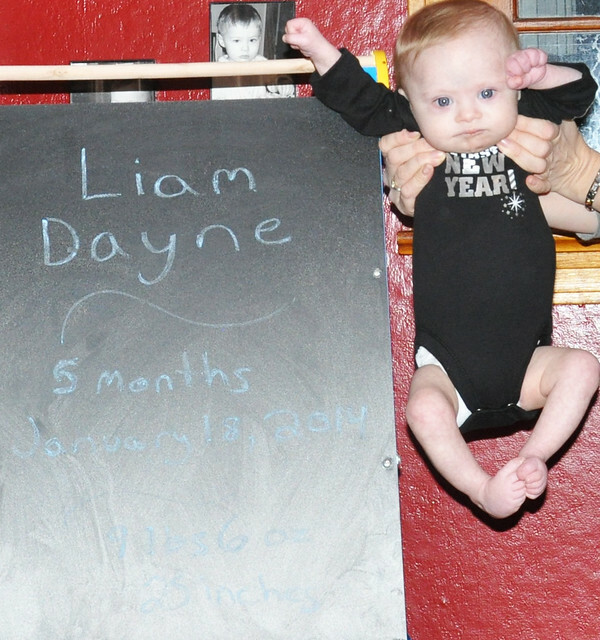 Liam turned 5 months old on January 18th. As usual, I'm behind with my posts, so this will be posting just before he turns 6 months old! Happy 5 months, my sweet boy! You are my amazing blessing. I learned so much from you in your 5 short months in my life. Your sweet face is the first thing I see every morning when I wake up and your smile melts my heart. Your beautiful spirit and incredible determination are evident in every single thing you do. I am honored to be your mom and I am so proud to call you my son. I love you with all my heart, my beautiful boy! MILESTONES: Pushing up on your arms, beginning to stand while holding onto our hands, working on a supported sit, and the ability to hold your head up for longer periods of time. TOOTH COUNT: None, but the tooth buds are there. You definitely have symptoms of teething! FIRSTS: Between 4-5 months, you celebrated your first Christmas, and rang in your first New Year. Unfortunately, you also had your first visit to Urgent Care. On the day you turned 5 months, you had your first solid feeding! EATING: You are mainly breastfed, and you are starting to give up your supplemental bottle. You started solids on the day you turned 5 months old. SLEEPING: You were sleeping really well, then got sick with pneumonia, so that messed up your sleep schedule. You still take several long naps throughout the day. SOUNDS/WORDS: You coo and giggle! LIKES: Eating, snuggling, being swaddled in a warm blanket, taking a bath, playing with toys while propped up in your boppy, and interacting with loved ones. DISLIKES: Being hungry or cold, and getting strapped into your carseat. FAVORITE TOYS: OBalls, OBall Car, and Soothe & Glow Seahorse. NICKNAMES: Miam (thanks to your sister, Lily), Little Dude, and Buddy. HEALTH: You finally had your first illness. You threw up while on your back, which led to you aspirating, which led to pneumonia. EARLY INTERVENTION: Miss Pam comes to our house once a week, and has been working with you to get you to gain weight consistently, and build the strength in your neck muscles, arms, and torso. STATS: 9 lbs 6 oz and 25 inches. WEARING: Newborn Diapers, some Newborn clothing, 0-3 month clothing, and size 0 shoes. PERSONALITY: You are so sweet, cuddly, determined, and happy. You are as social butterfly and love to interact with your family and friends! I can't take it, he is just the cutest! P.S. Happy 2014!! I am finally getting back into my blogging!! We love all the Oballs here too! They are probably the best first toys for little ones! Happy 5 months (actually 6 months -ssssh)! Happy 5 months! Happy 6th months! Liam is the snugglest!! I love watching Liam grow! He is so precious! I wish we lived closer so that we could meet in person, I think he and Cody would have a blast together!! He is so cute and continues to impress me! I love to read about how well he is doing! Happy 5, almost 6 months little one! These months are flying by. I have enjoyed watching you grow buddy.